Krispin Risdell has dreamed of adventure his whole life. Not content to follow the family tradition of farming, Krispin dreams of seeing the world and having the kind of adventures that ballads sing about. As Krispin pressures his parents to leave the farm, they hold on, always saying that, even though he’s nineteen years old, he’s still too young to be out in the world on his own. When Krispin discovers that the love of his life, a women he’s pined over from the days when they use to walk home from school together, has received a marriage proposal, Krispin knows that he must ask for her hand. Krispin hastily proposes to his dream girl and she gives him an ultimatum; if Krispin can have an adventure worthy of the story books and be back before the wedding in three months, she’ll marry Krispin instead. With his meager belongs and dreams as big as the world, Krispin sets out to have his adventure. After a week of wandering lost in the woods, Krispin thinks his adventure and his dream girl are lost forever, but he happens to meet a strange princess from a mysterious land called ‘Cerrado.’ The princess ask for help in a task she’s been charged with that will help save not only Cerrado but Krispin’s world too. 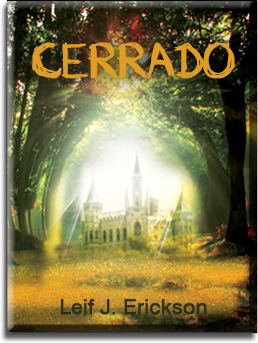 Not understanding where he’s going, the princess takes Krispin to the magical world of Cerrado where they must fight a very old evil power that’s growing to try and grasp control of the land. With the sometimes help and sometimes impeding of pirates, bandits, and the Nature Watchers, the children of Father Time and Mother Nature, Krispin and his princess battle for not only the future of Cerrado, but for the fate of Krispin’s world too.